There are two very different types of rooms. One inside and one outside away from the hotel. Inside has stairs and great security. Not sure about the other but check before you check in. Checking in was different- in the Gasthouse. The restaurant is geared to large , Primarily tour, groups. Food was good German cooking but don't assume if you have a room they can seat you for dinner. The price you found is 11% lower than this hotel's average rate of $301/night. 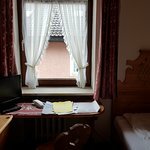 I booked this hotel with booking.com to arrive on a Tuesday, the check-in time stated was 3.30pm-10pm which was perfect as I planned to go straight from Fussen to Garmisch Partenkirchen, up Zugspitze mountain and visit a few lakes and check-in to the hotel around 6 or 7pm. However 2 days before I was due to arrive I received a message from the hotel via booking.com saying as their restaurant is closed on Tuesdays and check-in will close at 5pm, meaning only a 90 minutes window to check-in. 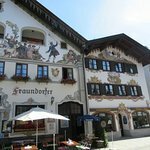 I replied asking if I can check-in between 10am-11am instead which is the time I will be arriving in Garmish Partenkirchen. I didnt receive any reply so I sent a second message via booking.com, and a third by email directly to the hotel, I did not receive a reply any of my messages, so I asked booking.com customer service to contact them. In an earlier message Booking.com confirmed the check-in time was 3.30-10pm. I then received a second message from booking.com on the morning I was due to arrive saying they have contacted the property and they said the hotel is fully booked and the room will only be available at 3.30pm. As it was too late for me to cancel and find some other hotel, I had to alter my plans and cut short my visit to the lakes so I could check into the hotel. The booking confirmation was confusing, I later found out even though it states check-in is 3.30-10pm, in the small print it states restaurant is closed on Tuesday so check-in will close at 5pm, so if you are checking in on a Tuesday be prepared to build your plans around the hotel 90 minutes check-in window. I dont know if this confusion was caused by the hotel or booking.com. When I arrived I couldnt find where to check-in, I was wandering about for 5 minutes in the empty restaurant, and then I went round the back. I then called the hotel phone number and all the phones around me rang but no one answered. Eventually someone came to the reception desk. 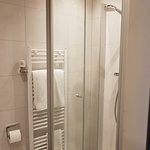 The room itself was great apart from the heating not working, very clean room, immaculate bathroom with shampoo and shower gel is included. The wifi worked great, I would lose connection sometimes but you just have to move closer to the door. 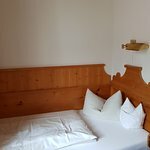 Its a good location on the main street, 18 minutes walk to the train station or you can get the bus (5mins walk), and 7 minutes walk to the REWE supermarket. The breakfast could have been better presented. They have different types of bread already on the table but is left uncovered and I did notice a few flies on it, and they place one glass of orange juice and flask of tea on the table whether you want it or not. It would be better if they leave all the bread on a covered counter, put the orange juice in a jug so the guests can help themselves. One strange thing was the seating arrangements, the waitress seated me on a table for 4 but this table had someone sitting there already even though they had 20 other free tables. Then two more guests arrived, and for some reason the waitress seated them on my table too. One was in a wheelchair which made the seating a bit cramped. I can understand it if there were no free tables but it was not busy at all and there were 20 free tables there, maybe they didnt want one guest to eat all the bread as the bread is shared per table. There were different types of bread available (as long as the other people on your table hasnt taken it), cereal, cold cuts, fruit. There was a type of sponge cake too but it was a bit stale I almost choked in it. I didnt think it was worth 9.50 Euros and if I stayed for a second night I would not have gone down for breakfast again. Completely missing concept of check-in and check-out. This process was between the reception of orders in a restaurant. So if you are looking for reception go straight to restaurant and be prepared to lift your luggage up to huge upstairs without any offer to help. If you will get a room at first floor be prepared to listen up to late hours a loud music and laughter from restaurant. The hotel staff cares more about the customers of the restaurant than about the hotel guests. At first we could not find the person who would give us the room keys (and when we finally found the staff was not friendly and it seemed that we were distracting them from more important things), then the parking lot is somewhere unknown and find it was a big challenge. Luckily we stood there only one night. But really location is good. Due this mess we declined a breakfast in hotel and had a quiet and good breakfast time in other place. My opinion - Staff tired of hotel visitors and they need go to vacation. We were in a 2-bed apartment in a house out the back - I think we were upgraded! - superb place. Best hotel I stayed at. Furniture is mainly pine and beautiful - proper Bavarian feel. Views are amazing. Heated bathroom floor, nice touch. Food was very nice, especially the Veal. Buildings are nice. Location is a quaint street nicely located in town. Supermarket, small walk away. Bus stop 3 min walk away. So impressed. GaP is amazing town to visit. Room tip: Apartment out the back is great. I have stayed in hundreds of hotels around the world and it is rare that I have an experience which truly merits a "poor" rating. 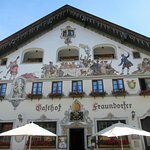 The building is charming at first glance, on a narrow street with shops and restaurants. It would have been nice to have received directions of how to access the parking lot in advance. There was no sign indicating where to turn so we had to circle all the way around Partenkirchen since it was a one-way street and we missed the entrance. There is severely limited parking behind the hotel, so you will want to get there early. We were lucky to get a parking space, however I was not pleased to get a rude welcome from the manager, yelling at me for parking too far away from the neighboring car. I had parked in one of the indicated spaces, and it was in fact some locals inside the restaurant who had parked terribly across multiple spaces. Perhaps they should consider clearly painting lines on the ground to indicate each space (although the other cars in the lot had parked so badly that these probably wouldn't make a great difference). Next, there was no indication of where to go to check in, so I ended up wandering around the dimly lit, somewhat dirty restaurant while every single employee blithely ignored me and the local customers stared blankly. Never have I felt more unwelcome upon entering an establishment. Eventually I spotted the lady who had harangued me in the parking lot standing in the kitchen. It turns out the reception is located in the kitchen. It really seems like the "hotel" part is an afterthought that the staff begrudgingly put up with. The lady immediately asked us to pay a visitor tax for the local government and pay for breakfast, and was displeased when I said we wanted to think it over before commiting. I got the sense that she was a kind person, just somewhat burned out with the demands of running the business. The room itself was fine, a little two-bedroom apartment that was comfortable if not luxurious. No sooner had we settled in than the phone rang. It was the same lady impatiently asking about breakfast , so we politely declined. The wifi in the room was spotty throughout our stay and we didn't get so much as a smile when we checked out the next morning. I will end by saying that the staff needs extensive hospitality training. I got the sense that they are nicer to locals, so if you speak German you might have a better time.